If that gets picked, we’ll have lots of fun with it and observe how much game Twitter has changed socially, in cycling, and for business. 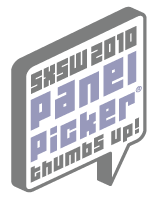 We can’t think of a better way to talk at SXSW than with audience participation. Of course, I’ll talk about what we do here at Bike Hugger and more. Please give the panel a thumbs up. Voting closes this week on September 4th.